Mom, the Intern: Lights, Camera...Animals? Last week, I overheard one of our floor directors/camera men talking to the morning producer. He said, "If the interns were willing to come in at 4:30 a.m., I would be happy to let them run cameras and help with the show. But none of them want to come in that early!" "I'll come in at 4:30 next week!" Immediately regretted it. But hey, at least I'd miss traffic! So, Tuesday came. 3:15 -- alarm goes off. I got up, got dressed, drove to the station. It's amazing how few cars are on the freeway at 4 in the morning. In case you were wondering. The first day, the floor director gave me a headset to wear while I watched the show in the studio. It was fun to hear all the director's cues; I immediately hearkened back to my days as producer at the Daily News. I just love being part of all the behind-the-scenes stuff! We had some guests come in from the San Diego Zoo. That's right, ANIMALS. They brought out this huge owl called an Eagle Owl. It looked massive but they said it only weighed 5 pounds! Lots of feathers to make it scary-looking to unsuspecting rodents, I suppose. It was cute and very calm, until it suddenly tried to take flight in the studio! Luckily, he was tethered to the zoo employee's arm, so he couldn't get far. But those wings...they were massive, and they created quite a windstorm! You should have seen the female anchor's hair blowing. 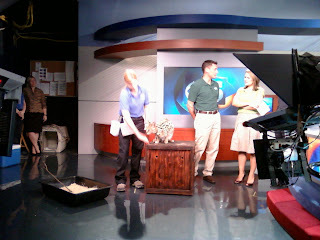 Next, they brought out this cat called an African serval. It is a medium-sized cat (bigger than a housecat, smaller than a bobcat) with a long neck and big ears. That box he's sitting on -- don't worry, no animals were inside. It's just a prop. For the noon show, I ran the teleprompter. Just like old times at the Daily News. I'm the only intern who has so far. AND. I'm the only intern who has operated a studio camera! That's right. 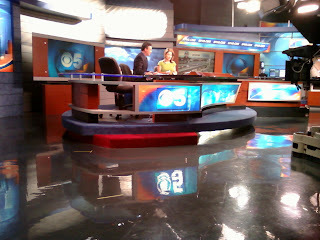 Yesterday, when I showed up at 4:30 AGAIN, the floor director asked if I wanted to run the camera. I reluctantly said yes, but I knew this was my only chance to do it (they have robotic cameras at the Daily News). It was crazy, but so fun! Those cameras are small but the tripods are HUGE. They roll around on wheels and can raise up and down with hydraulics. It's nuts. But I was fine because I understand the broadcast lingo and know how to read the run-down (spreadsheet organizes the show with a list of the slugs [story names] and their corresponding time length, graphic, and camera shot). And I know how to listen to a director. So thank you again, BYU Daily News and Comms faculty, for preparing me so well for this internship! I'm still on my way to finishing my hours. I can't believe how rapidly it's all coming to an end. At one point, I thought I'd never be finished. But the end is less than 2 weeks away now! And I'm a little sad. I am going to miss it. Oh man! You're almost done!! Then what?! Crazy!! You are such a go getter! You go girl!! I produced our 5 AM show at KSL for four months, and I thought I would DIE before I made it to the end. But it's kind of exhilarating too. Congrats on being such an intern superstar! And good luck getting it all done. Don't tell, but I don't think I even completed all of my hours. I have KSL to thank for letting me graduate anyway. Oh, by the way, I just gave you an award on my blog! check it out!